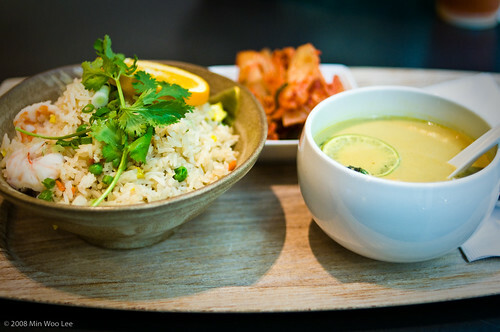 It certainly felt special to be able to order in a museum cafeteria [in the US] a bowl of fried rice, Malaysian curry noodle soup and a side dish of kimchi. That comes probably true only in a museum that is dedicated to Asian arts. Thanks to Target First Free Sundays, we were granted free admission to the San Francisco Asian Art Museum on Sunday few months ago and spent the afternoon exploring all kinds of Asian art forms, starting with Asian foods in the cafeteria on the first floor. The foods tasted pretty authentic and "clean," meaning no artificial ingredients or MSG added. I liked that. If you are in the area, be sure to check out the Asian Arts Museum and their cafe on the first floor. Oh, that looks so good! I'm going to try to make that sweet rice, but I have to find the ingredients first. Go for it while they are in season now! For anybody who is any those types of those that loves to offer funky products and now have a good louis vuitton replica meant for way sacks after this you are definitely the ideally suited pick for that hobo container. These days, Gucci hobo container is certainly critical to your fashionable gal. Hobo sacks are usually moved that will office environment or come to an event. Any reputable Gucci hobo louis vuitton replica consist of a fact price tags. The worth may be very huge. May buy a good replacement Gucci hobo container meant for under 200-300 greenbacks or simply is beneficial upwards of multitude of greenbacks for that modish fashionable Gucci hobo container. On the market in many varieties, variations together with designs, may buy imprinted hobo sacks as per your finances. The favored varieties during hobo sacks comprise, zilch elite, get string hobos, clutch system layout, rectangular layout, slim layout, flap layout, arranged styles, sequence control layout together with pail layout hobos. Any present-day posh Gucci hobo container are usually conveniently louis vuitton replica by just your falcate pattern together with by yourself tie. Gucci hobo sacks, may well conveniently get asked have already been manufactured for the trendy daytime multitasking gal, for their outward budgets together with lots more bodily room or space which aid it all the ideal container to include mobile phones, credit/ debit homemade cards, PDA’s, cosmetic foundation together with other necessary solutions. Numerous substances widely-used during the invention for this container. Most of the famous substances that can be chanel outlet to build hobo sacks comprise laminated canvas, velvet, synthetic chanel outlet, pure cotton, suede, corduroy, vinyl coated canvas, nappa synthetic leather, jacquard garment, bubble rubber together with denim amongst others.